Practice English and Spanish in a high quality language translation, by reading them side by side, and comparing the expressions with the language you know. -from "Emerson, Truth, and a Medicine Wheel"
-de "Emerson, Verdad y Rueda de Medicin"
You imagine yourself as a dolphin, or a hawk gliding over the snow, first the hands, then the feet tilting in unison into the plane of the hill. The poles swing lightly, the boots are comfortable and you feel balanced as you roll the skis onto edge. You are skiing in harmony… with your equipment ,within yourself, with the mountain, and in your animal spirit. An air of detachment has surrounded you, and your athleticism is being directed from the subconscious. Imagina que eres un delfín o un halcón mientras te deslizas por la nieve. It sometimes seems that we are forever dinking with our equipment. Because this is not a simple swimsuit in the purse type of vacation, it’s good to approach the process with humor. On the brighter side ,as was pointed out," all good athletes blame their equipment." The most important equipment are the boots, because they are the levers , the extensions of the feet that transmit your athletic movement to the skis. They should snugly support your feet without discomfort. A footbed in the boot, made for you and set up by an alignment specialist, can correct the asymmetrical differences that we each have in our bone structure. 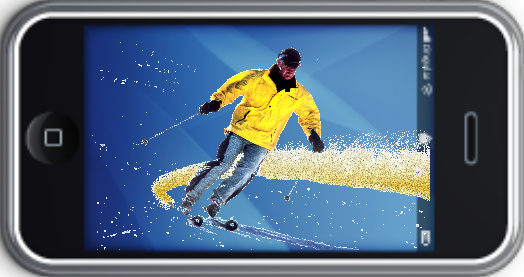 With the process of setting up the boots done, you are able to roll both skis onto edge at the same time from a centered stance. A blessed event. The easiest equipment to get right are the poles. They help define the spatial relationship of the upper body, through the hands, to the snow. We often are outfitted with poles too long, or that are bottom heavy, causing us to raise our hands and shoulders up and back to keep from inadvertently dragging the poles in the snow as we ski. Some poles have adjustable lengths, but the same thing can be accomplished by moving your grip up or down, or having your poles cut down in the local ski shop. These are quick, easy on the budget, solutions. With balanced poles, the right length for you, it’s easier to start the new turn with a pole swing that’s natural and accurate. So much is written and said about the new skis that I’ll just say go for a good shaped ski . Whether you are renting or getting your own skis tuned, ask a couple of the local ski pros in your area where they take their own skis to be tuned. The new skis are all so good, that tuning may make the biggest difference affecting your enjoyment, allowing the ski to react predictably. When you SKI IN HARMONY® you are not using your athleticism to compensate for poorly adapted equipment. Poles that swing easily, comfortable, aligned boots, and a well tuned ski become an unconscious part of you. A veces nos sentimos en una lucha permanente con nuestro material de esquí. Es porque no es un simple traje de baño, hay que planteárselo con buen humor. Además ³todos los que se precien de deportistas, insultan con frecuencia su material². La parte más importante del equipo son las botas, porque son la palanca, las extensiones de los pies que transmiten tus movimientos a los esquíes. Deben sujetar firmemente tus pies sin molestar. Una plantilla en la bota, hecha a medida por un especialista en alineamiento, corregirá las asimetrías que todos tenemos en nuestra estructura ósea. Una vez completado el proceso de ajuste personalizado de las botas, podrás cantear tus esquís simultáneamente desde una posición centrada. Una bendición. En la elección del equipo apropiado, lo más fácil son los bastones. Nos ayudan a definir la relación espacial de la parte superior del cuerpo, a través de las manos con la nieve. A veces nos equipan con bastones demasiado largos, o demasiado pesados, lo que provoca que levantemos y retrasemos en exceso las manos y los hombros para evitar arrastrarlos por la nieve mientras esquiamos. Algunos bastóns se pueden ajustar en longitud, pero podemos conseguir el mismo efecto agarrando los bastones más arriba o más abajo, o cortándolos en una tienda de esquí. Estas son soluciones rápidas y baratas. Con bastones de longitud adecuada, es más fácil comenzar el nuevo giro con un balanceo del bastón natural y preciso. Hay mucho que se ha dicho y escrito sobre los nuevos esquís, por lo que yo sólo diría, hazte con un buen esquí ³carving². Tanto si alquilas los esquíes, como si los llevas a poner a punto, pregunta a los profesores de la estación a dónde llevan sus propios esquíes a repasar. Los esquíes nuevos son todos tan buenos, que quizá el tratamiento de cantos y suelas supone la mayor diferencia de unos a otros, en beneficio de tu disfrute y permitiendo que el esquí reaccione de forma previsible. Los bastóns que se mueven con naturalidad, las botas confortables y alineadas, y un esquí bien afinado se vuelven parte de ti. Because one side of the brain controls the muscles on the other side of the body, movements of the arms enhance similar motion in the legs. If you can bend your right elbow and your right knee, then you can make a pretty good right turn, and if you can bend your left elbow and your left knee you can make a pretty good left turn. This corresponds to the pole swing motion, and release of the ski that you use to transition and start a turn. Together, the hands tilt upward in the new direction and the feet tip and spiral in parallel relation to the hands. In quick, short turns it’s often easy to see the hands tilting into the new plane before the feet match them. However, I’m making it sound harder to tap the benefits of the harmony within yourself than it is. Start a right turn by pointing alongside the right ski with the right index finger, in the direction you want to go, then doing the same on the left side. Bending the elbow and turning the wrist to point is all that is necessary to do to start turning on easy terrain. If you’re in the moguls think of the thumb pointing, and follow it with a smooth extension of the legs over the side of the bumps. As the wrist rises and rolls, the ankles roll naturally, releasing tension on the edge of the skis. You are then free to cobble together the foot skills that work well for the conditions that you are skiing. Upper and lower, and each side of the body naturally move in harmony with each other, and will effectively, when the turn is transitioned by a tilt of the hands into the new direction. Debido a que un lado del cerebro controla al otro lado del cuerpo, los movimientos de los brazos acrecentan un movimiento similar en las piernas. Si puedes doblar el codo y la rodilla derecha, puedes hacer un muy buen giro hacia la derecha, y si puedes doblar el codo y la rodilla izquierda, puedes hacer un buen giro hacia ese lado. Esto corresponde al movimiento de balancear el palo y aflojar el esquí que usas para la transición y empezar a doblar. Juntas, las manos se dirigen hacia arriba en la nueva dirección y los pies se inclinan, moviéndose en espiral en relación paralela a las manos. Durante las vueltas rápidas, muchas veces es fácil ver las manos inclinándose al nuevo plano, antes de que los pies hagan lo mismo. Sin embargo, estoy haciendo más difícil de lo que parece tener los beneficios de la armonía dentro de uno mismo. Comienza una vuelta hacia la derecha apuntando hacia el lado del esquí derecho con el dedo índice derecho, en la dirección que quieres ir, y luego haz lo mismo con el lado izquierdo. Doblar el codo y la muñeca hacia el punto indicado, es todo lo que se necesita hacer para tener un giro en tierra firme. Si estás en las colinas apunta con el pulgar, y síguelo con una suave extensión de las piernas sobre un costado de la colina. Cuando la muñeca sube y gira, los tobillos giran con naturalidad, liberando tensión en los cantos de los esquís. Eres libre para escoger cuáles son las mejores técnicas o habilidades a desarrollar para tu forma de esquiar. Cada lado del cuerpo se mueve en armonía con el otro lado, lo mismo hacia arriba y hacia abajo, y serán siempre efectivos, cuando el giro esté mediatizado por un giro de las manos hacia la nueva dirección. As mystical as it sounds, becoming one with the mountain is easy to see, simple to do, and corresponds with effective use of the harmony within yourself. When the right elbow bends and the wrist rises with the pole swing, and the right knee bends with the roll of the ski, one side of you shortens to become the uphill side and the other lengthens to become the downhill side. Your body moves into alignment with the plane of the hill. If everything has gone reasonably well, your feet do because you’re standing on it, and your upper body does because the pole swing gave an up hill and forward relation to the leading hand. To see for yourself, turn to a stop in freeze frame fashion. Notice whether or not your hands and feet finish in a similar relationship to the mountain. Así, místicamente hablando, ser uno con la montaña es simple de ver, fácil de hacer, y se corresponde con el uso de la armonía dentro de uno mismo. Cuando el codo derecho se inclina y la muñeca se eleva con el bastón balanceándose y la rodilla derecha se inclina con el giro del esquí, uno de tus lados se achica para adaptarse a la cuesta arriba y el otro lado se extiende para adaptarse a la cuesta abajo. Tu cuerpo se alinea con el plano de la montaña. Si todo ha ido bien, tus pies también irán bien, porque estás sobre ellos, y la parte superior de tu cuerpo también se mueve al unísono, porque el balanceo del bastón creó una relación con la mano que guía el movimiento hacia delante. Si quieres comprobarlo, giro y detante al estilo parada de imagen. Fíjate si tus manos y tus pies terminan en una posición similar a la montaña. La combinación del movimiento de manos y pies, del cuerpo, en armonía con la ladera de la montaña, crea una postura solida sobre el canto de los esquís y corre en la dirección del giro. Esto unifica los beneficios de la armonía dentro de ti mismo, y con tu equipo. The hands and feet move in the four directions and vertically, into the plane of the hill, and in the direction of travel, changing planes to start the new turn and release the edges of the skis. Done slowly, as the hands tilt and turn, each part of the body follows, creating a weave like wind blowing over tall grass; the rhythm of the new pole swing beginning the flow into the new turn. Las manos y los pies se mueven hacia las cuatro direcciones y verticalmente, al nivel de la montaña, y en la dirección del movimiento, cambiando los niveles para empezar el nuevo giro y liberar los cantos de los esquís. Lentamente, mientras las manos se inclinan y giran, el cuerpo las sigue, creando una onda como el viento que sopla sobre el pasto crecido; el ritmo del balanceo del bastón sigue el flujo en el nuevo giro. Armonioso y coordinado, el movimiento de los brazos y las piernas a través de las cuatro direcciones crea movimientos espirales en la nueva dirección del deslizamiento. Estos movimientos espirales hacia las cuatro direcciones, son los dones atléticos desplegados cuando esquías en armonía sm. While integrating movement in the 4 directions into a harmonious relationship within yourself and with the mountain, see if there is an animal persona that appeals to you.. It may be from instinct, a sense of play, or perhaps an animal spirit catches your imagination. I don’t know how these things work, and there are no rules limiting this that I’m aware of, except it is you who decides. Then you’ve begun to Ski In Harmony ® with your animal spirit. 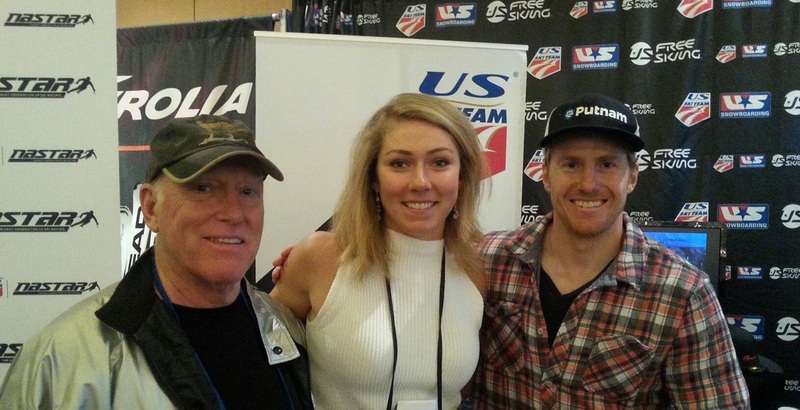 American Downhill Champion and Olympian, Chad Fleischer, has adopted the persona of the snow leopard for its aggressiveness. Picabo Street has raced with a ram painted on her helmet. The German women’s team race in tiger suits. And in golf…Tiger what’s his name? Oh well, maybe it’s not the same thing. Raydean of the Zuni Indian tribe has always known that his spirit was a crane, and skied that way when he knew that he could. Jody thought that maybe a woodpecker was appropriate because she kept getting pitched forward as she tried to learn the bumps on Telemark skis…that humor again. Chinese masters of Kung Fu regarded animals for the inspiration of their forms. Lance Armstrong’s coach based their training regimen on certain animals ability to develop slow twitch, oxygen storing, muscle fibers good for endurance in climbs. He can’t prove that it works, except that you’d be arguing with results if you said that it doesn’t. My all time favorite though , is a sixty plus year old, timid housewife without an athletic background, to whom I mentioned that some of us chose an animal with which to identify. Actually asking her what animal she was seemed like a stretch. A few minutes later she skied over and said excitedly that, she was a squirrel. When she hung out clothes in the back yard in Oklahoma she would watch a squirrel who was so uninhibited, that he had all of the characteristics she wished for herself, so that she could ski with her grandchildren. Three trips further up the hill that day covered many of the easy slopes and gave her that wish. As you integrate movement in the 4 directions into harmony within yourself and with the mountain, begin to explore with your imagination the spirit of your animal. Then you’ve begun the next verse of Ski In Harmony®. Cuando integras el movimiento hacia las cuatro direcciones en una relación armoniosa dentro de ti mismo, y con la montaña, piensa si hay un animal con el que te identificas. Puede ser desde el instinto, por la sensación de jugar, o tal vez el espíritu de un animal atrape tu imaginación. Desconozco cómo funciona este proceso, pero tampoco reglas que lo limiten, salvo que eres tú quien decide. En ese momento has comenzado a esquiar en armoníasm con tu espíritu animal. Chad Fleischer, campeón americano de descenso olímpico, ha adoptado la personalidad del leopardo de las nieves, por su agresividad. Picabo Street ha competido con un carnero pintado en el casco. El equipo femenino alemán compite con trajes que imitan la piel de tigre. Y en el golf…¿Tiger?, ¿cuál es su nombre? ¡Oh , creo que no es lo mismo! Raydean, de la tribu india Zuni siempre supo que su espíritu era una grulla, y esquió de esa forma cuando fue consciente de que podía hacerlo. Jody pensó que quizás un pájaro carpintero era lo más apropiado, porque siempre se lanzaba hacia delante cuando intentaba esquivar los baches en su esquís de Telemark… no hay que perder el humor. Los maestros chinos de Kung Fu se inspiraban en animales para sus técnicas. El entrenador Lance Armstrong basa su plan de entrenamiento en la habilidad de ciertos animales para desarrollar lentas sacudidas, almacenamiento de oxígeno y fibras musculosas resistentes para resistir largos ascensos. El no puede probar que esto funcione, pero el que lo niegue, tendrá que enfrentarse a los rotundos resultados. Mi mejor recuerdo está va dedicado a una mujer de más de sesenta años, casada, tímida, sin antecedentes atléticos, a quien le mencioné que algunos de nosotros, escogemos un animal con el cual identificarnos. Cuando le pregunté con que animal se identificaba, no supo qué responder. Unos minutos más tarde me contestó con entusiasmo que ella era una ardilla. Cuando salía a tender la ropa en el jardín posterior de su casas de Oklahoma, solía mirar a una ardilla muy desenfadada, con la personalidad que ella hubiese deseado para si misma, y así podría esquiar con sus nietos. Tres bajadas más tarde, ese día, habíamos esquiado varias de las pistas de principiantes y ella pudo cumplir su deseo. Cuando integras el movimiento hacia las cuatro direcciones en armonía contigo mismo y con la montaña, comienzas a explorar con tu imaginación tu espíritu animal. Entonces habrás comenzado el verso siguiente de Esquiando en Armonía™.